HONOLULU – Governor David Y. Ige, the Hawaii Department of Transportation (HDOT), and federal, state and community partners kicked off the state’s 8th annual Pedestrian Safety Month today at the State Capitol with an official proclamation ceremony. Held each August, Pedestrian Safety Month works to increase awareness of pedestrian safety to make Hawaii a safer place to walk. 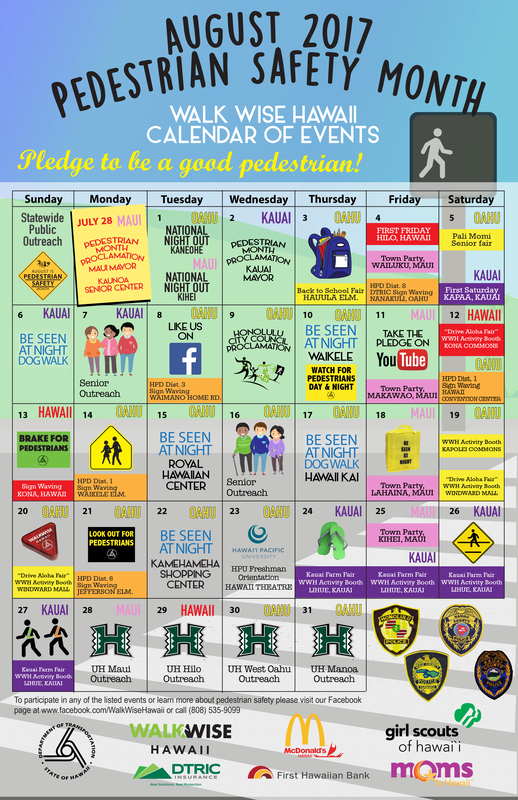 The month is organized by HDOT’s Walk Wise Hawaii program and will feature daily public and private pedestrian safety events. In 2016, there were nearly 6,000 pedestrian deaths in the U.S., which is the highest in more than two decades. State data shows that there were 32 pedestrian fatalities in Hawaii in 2016, and one pedestrian fatality in 2017. During today’s event, HDOT announced a new community partnership with the Girl Scouts of Hawaii. Walk Wise Hawaii conduct safety presentations to nearly 5,000 Girl Scouts throughout the state. 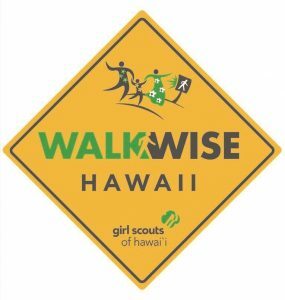 Girl Scout troops will then create a pedestrian safety project to share key Walk Wise Hawaii safety tips with the public, earning each participating Girl Scout an inaugural Walk Wise Hawaii Pedestrian Safety Patch. Always be prepared to stop when approaching a crosswalk. A pedestrian may be hidden from view. Be vigilant. Always look for pedestrian movement in your direction. Yield to pedestrians in crosswalks. Proceed when the pedestrian has safely passed your vehicle. Be aware that pedestrians can be hidden from view when you are stopped at multilane roads. When driving between dusk and down, watch for pedestrians in dark clothing. Always use your headlights. Always watch for pedestrians when backing out of driveways or parking stalls. Children can be hidden from view. Make sure that you are fit to drive. The brochure features a Drive Wise Hawaii Pledge for drivers that asks them: “As a good driver to always be aware that pedestrians can be hidden from view by stopped vehicles on multi-lane streets.” Brochures will be distributed at participating McDonald’s Restaurants of Hawaii drive-through locations and community events throughout the state during Pedestrian Safety Month. Pedestrian Safety Month public partners include the City & County of Honolulu’s Department of Transportation Services; all County police departments; the Hawaii Police Department’s Community Policing Teams and Neighborhood Security Watch Teams; and Safe Routes to School. Private partners include First Hawaiian Bank, DTRIC Insurance and Moms In Hawaii. Pedestrian-related community events and campaigns will be taking place throughout the month to encourage safe pedestrian behaviors and raise driver awareness of pedestrians. To view the Pedestrian Safety Month calendar of events, please click here. 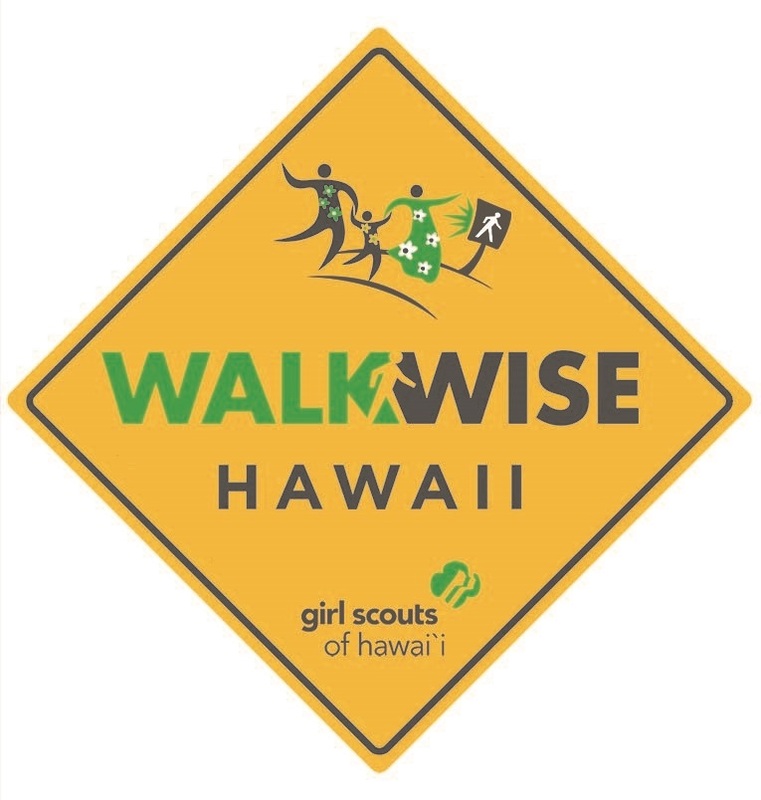 For more information on Walk Wise Hawaii and a list of Pedestrian Safety Month events, call (808) 587-2160 or visit https://www.facebook.com/WalkWiseHawaii/. Walk Wise Hawaii is a public education program focusing on pedestrian safety and driver awareness, and is sponsored by the Hawaii Department of Transportation through its “Safe Communities” program with funding from the National Highway Safety Administration (NHTSA). Walk Wise Hawaii has employed extensive outreach methods including partnerships with public and private entities since its inception in 2003. Supporting almost 5,000 girl and adult members statewide, the Girl Scouts of Hawaii (GSH) builds girls of courage, confidence and character to make the world a better place. GSH’s headquarters is located on the island of Oahu, with three neighbor island service centers on the islands of Hawaii, Kauai and Maui. GSH is chartered by the national office, Girl Scouts of the USA (GSUSA) and is responsible for the leadership, administration and supervision of Girl Scout programs in the State of Hawaii. For more information about GSH, visit www.gshawaii.org or call (808) 595-8400. McDonald’s Restaurants of Hawaii has 86 restaurants and more than 5,200 employees in Hawaii, Guam, and Saipan. In Hawaii alone, the company has 76 restaurants and more than 4,600 employees. McDonald’s total economic impact on the state, directly and indirectly, is about $370 million in spending and nearly 12,000 jobs. McDonald’s prides itself on offering career opportunities to employees, with most managers staying with the company for more than 18 years. Follow McDonald’s Restaurants of Hawaii on Twitter at @McDonaldsHawaii.